Is Inflation Not A Problem In China Anymore? Let’s take a break from all the gloom and doom talks from the euro zone and discuss some bit of good news from China. Earlier this week, it was reported that the country’s CPI plunged to its lowest level in 14 months! Yup, you read that right. On Thursday, government data showed that CPI was only up 4.2% from a year before, while the PPI grew by 2.7%. To take the figures into context, both inflation reports came in below their forecasts which were at 4.6% and 3.3%, respectively. And yes, the 4.2% uptick in consumer prices is the lowest reading we’ve seen in more than a year. Digging deeper into the report, I found out that the pullback in food prices had the biggest effect on the lower CPI figure. The stats reveal that the general level of food prices only increased by 8.8% during the month, more than 2% lower than the 11.9% reading we saw in October. November’s figure translated to the fourth consecutive month of slowdown in consumer prices. And you know what? 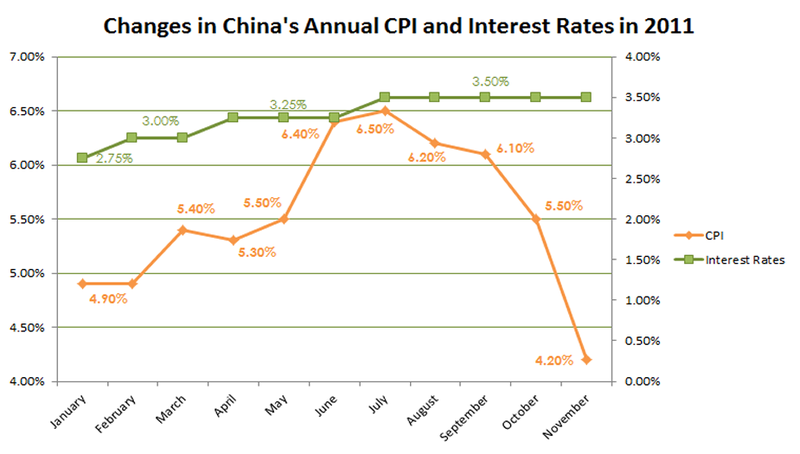 Some analysts say that we will see inflation cool even more in 2012, possibly averaging around the PBOC target rate of 4.00%! Not surprisingly, this has gotten a lot of market junkies giddy that the PBOC could ease monetary policy even further. And so, more stimulus from the central bank could boost the growth of the world’s second largest economy and spur its trading activity with other countries. So what could the central bank do, you ask? If you remember, earlier this year, the high level of inflation had the central bank shoring up excess liquidity in the system like crazy! So, for one, they could cut the reserve requirement ratio (RRR) which is the mandatory amount of deposits that Chinese banks must keep on reserve. At the start of the year, the RRR for large banks was at 19.00%. However, it trickled higher as inflationary pressures grew. As you can see on the chart below, the PBOC increased the RRR by 50 basis points every month starting from January to June. Officials left it unchanged at 21.50% as the CPI steadily retreated from its three-year high of 6.50%. That is, until this month. On November 30, the central bank announced its first RRR cut since 2008. Starting December 5, 2011, large banks only have to set aside 21.00% of their total deposits in reserve, down from 21.50% in the previous months. Remember that the move happened before the November inflation figure was released. Taking into consideration the slowdown for the month may just give the PBOC the confidence to allow for more liquidity in the economy and follow up on its RRR cut! The PBOC could also cut interest rates. In the process of taming inflation during the first half of the year, the central bank hiked borrowing costs three times from 2.75%. Now standing at 3.50%, some analysts say that our chaps over at the PBOC have more room to lower the interest rates and stimulate growth. In fact, some of them predict that we could see a rate cut as early as Q1 2012! Both moves would free up more capital and make more cash available for lending which could consequently boost economic growth. You know what this means, right? Because China is almost everyone’s major trading partner, the prospect of stronger growth in the country is good news to other economies too! With that said, we would probably see risk appetite pick up when the PBOC implements further easing. That is, of course, assuming that the CPI continues to trend lower and that November’s report isn’t just a one-time event. 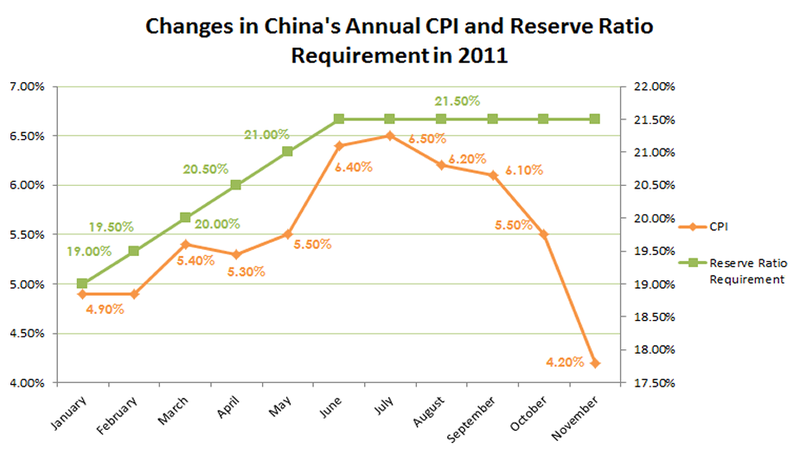 Do you think we’ll see more easing from the PBOC in 2012?